With the degree of injuries and suffering experienced when involved in a motorcycle accident, compensation is merited for victims of this two-legged vehicle accident. All that is required is an excellent motorcycle accident attorney who’s able to prove beyond reasonable doubt that the motorcycle accident wasn’t caused by you, and you deserve compensation for having experienced such traumatic event and being injured by it. 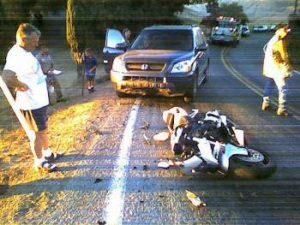 If you can provide adequate details to help your cause, Rawa Law Group can provide a proficient motorcycle accident attorney in Chino to assist you to win your case. All Rawa Law Group attorneys are knowledgeable in personal injury cases; in fact, we have some of the best personal injury lawyers in California. Our lawyers are aggressive in the courtroom and are willing to put in serious efforts to see you are duly compensated for your motorcycle accident. We can come around to either your hospital or home to take all the details about your case. Also, our consultation and case evaluation are free, so you don’t have to worry about your budget. We also don’t get paid till we have won your case, so you can take advantage of our zero deposit, no obligation case evaluation to get started. Why trust Rawa Law Group? We have helped recover hundreds of millions in settlement for different claimants in California and we’d be happy to help you get the right cash settlement as stipulated by law for your motorcycle accident. Get in touch with Rawa Law Group today.